This spacious country house is located in the centre of the island between the villages Lloret de Vistalegre, Montuiri and Sineu. 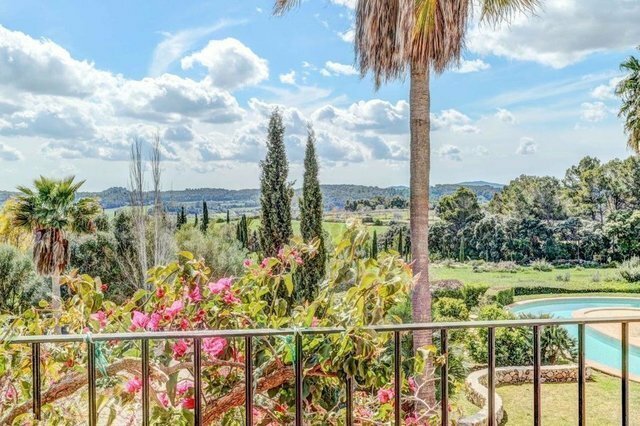 The property has been build with high quality materials and has fantastic views all around, several covered and open terraces and an exceptional large horse shoe pool. The property provides a spacious living area and a big dining room as well as an amply and fully fitted kitchen. The house has 5 bedrooms, 4 bathrooms (3 en suite) and a guest toilet. In addition, there is a new reformed guest apartment with separate entrance, 2 bedrooms, bathroom, kitchen and own terrace. The small village of Lloret de Vistalegre, also known as Llorito, has about 1.200 inhabitants and is located in the centre of Mallorca. The heart of the area is set on a small plateau, which provides beautiful panoramic views. Its mills and wells stand out for their character, as well as "Sa Comuna"- a natural space for public use which consists of pine forests, where people gather to celebrate parties and other events. The most popular celebration is a major party called "Es Sequer", which is a gastronomical celebration of the fig harvest in august. The village provides supermarkets, several grocery stores, restaurants, coffee shops and a pharmacy. The Village is about 25 minutes away from Palma centre and the airport, and 30 minutes from the nearest beaches.